Last Wednesday I meet with Steve Birnhak, of InWindow advertising along with Steve Lambert and Laura Maccleery. As I said in some earlier posts, Steve and his partner Ray were actually quite interesting characters, if not simply for their desire to work with the public and find a way to operate their business within the confines of the the law. They seem genuinely concerned with the city, it's economic predicament as well as the beauty of our shared public spaces. One of the immediate arguments Steve and Ray offered for continuing their illegal storefront vinyl wrap business was simple aesthetics. 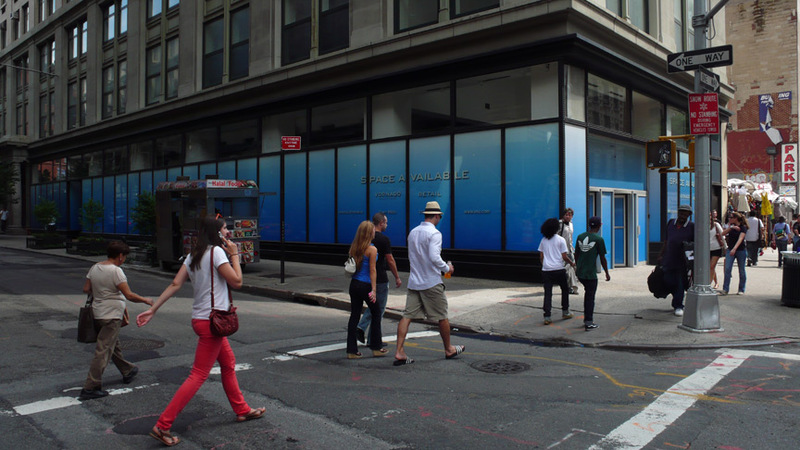 We sat at Franelli's in SOHO, across from an abandoned storefront whose paper window coverings, hiding construction debris, within were beginning to fall down and become "unsightly". This was pointed out as a good reason to employ giant billboard sized street level advertisements to cover up the problem. According to InWindow, the ads prevented the typical quick decline associated with urban blight as explained by the broken window theory. A few days ago I ran across the juxtaposition illustrated below which I think properly exemplifies why this argument doesn't hold water. The first photo is of my newest InWindow find, located at 355 Broadway. 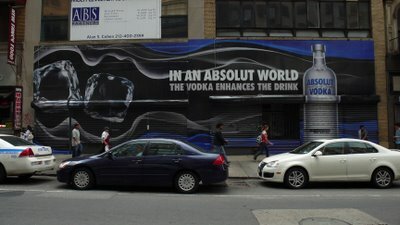 This Absolute Vodka advertisement not only obscures the windows, but the entire 80 plus foot storefront, including gates and columns. It does a good job of covering what may or may not be a decrepit storefront. 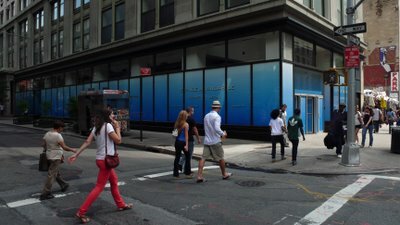 The second image below shows the old Tower Records storefront wrapped in a simple pale blue vinyl sporting the name and number of the Realtor responsible for getting this property back on the market. I would like InWindow to take note of how aesthetics are solved without selling the city to Absolute Vodka or the commercial interests of a few, including InWindow.